The comic Alabaster: Wolves by CaitlÃ­n R. Kiernan has been on my to-read list for ages, and at long last, Iâve given it a read. Alabaster: Wolves is a kind of spinoff of Kiernanaâs earlier stories. Her character Dancy Flammarion existed in those earlier works as a demon slayer, but now she is here in this strange world to face new troubles. I got my hands on Issue #1 of this award-winning comic book and after this small peek into Kiernanaâs dark world I canât wait to get my greedy hands on the rest of the series. 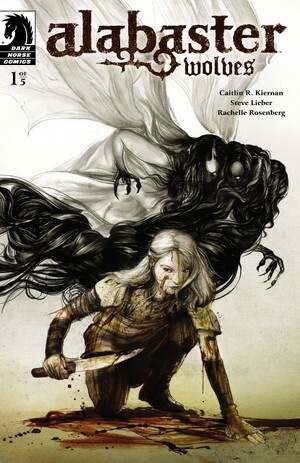 “International Horror Guild Award-winning author CaitlÃ­n R. Kiernan brings one of her most enduring and popular creations to comics! Love love love the cover art! Love! Itâs ominously beautiful. The inside art was basically the same olâ comic art we see in nearly every comic out there. It was still great though, the werewolf looked badass. The world of Alabaster: Wolves is, well, itâs a mystery. An eerie mystery. Readers are unsure whether or not the story is taking place in a version of our world or a totally alternate universe. But in this first issue, we see Dancy traveling through a world that is similar to ours, but dark and desolate. The birds talk, buses run through empty towns, and thereâs an albino 17-year-old albino girl who kills monsters at the request of her angel. We also see the beginning of Dancyâs trouble with the werewolves. I would suggest giving this comic a read. Iâm intrigued by this gritty world and I want more of it. Have any of you read the entire series? If so, what did you think?